Janice Sevre-Duszynska,RCWP above in stole and in the middle in of social justice advocates at Maryille College and the Nuclear Weapons Complex in Oak Ridge, Tennessee. It is the front page story in Streetvibes, Cincinnati's activist newspaper advocating justice and building community. The title of the conference was Resistance for a Nuclear-Free Future. We also commemorated the 30th anniversary of the Plowshares Movement, The Nuclear Resister and Nukewatch. "Would someone in Rome formally excommunicate me, please? I want to be excommunicated by the Roman Catholic Church because walking away will break my heart. My grandparents left Ireland with nothing but their vibrant faith. 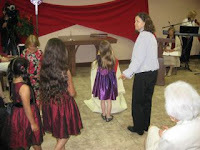 They and my parents brought my siblings and me to a baptismal font and promised to guide us to Christ. And, they did that by word and deed. They taught us to love the Gospel and challenged us to live that Gospel at all costs. I love the Mass, Catholic social teaching, the scores of nuns who built the church around the world, the dedicated priests and people who love God with all their hearts and bring that love to the world. It is my life, the center of every experience, the filter for reality. But, the headlines continue — more pedophilia, more stonewalling by the bishops, more "norms" from Rome protecting perpetrators. Now, it is a "crime" of the church to attempt to ordain people like Mother Teresa or St. Teresa of Avila — women. And, the hierarchy, who have arguably hidden crimes and criminals, who will not open the books so we can see where our money has gone and who always claim the moral high ground, have grouped ordaining women with pedophilia. Our heads swirl. How can we stay in a church whose leaders protect pedophiles? Yet, how can we leave and relinquish our church to those very leaders?..." Sheila O'Brien is a wife, mother, daughter, sister, a product of 22 years of Catholic education and active in her parish. She is a justice of the Illinois Appellate Court, Chicago. Judge Sheila O'Brien's earnest plea for excommunication reflects the pain at the heart of many Catholics. Indeed, how can the Vatican protect pedophiles and excommunicate women priests? Since this news, Roman Catholic Womenpriests have heard from many people, especially women, who are fed up with the church's discrimination against women. The good news is that some qualified women are discerning a vocation to the priesthood! San Diego, CA – Mary Magdalene Apostle Catholic Community (MMACC) joyfully announced today the ordination of community member and new Assistant Pastor Nancy Corran. The ordination ceremony was held on Saturday, July 31 at 7:00 p.m. at Gethsemane Lutheran Church and was attended by over 150 community members and guests. 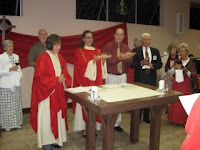 MMACC is a Roman Catholic parish trying to lead the way in bringing reform and much needed changes to the Church. Led by Pastor Rev. 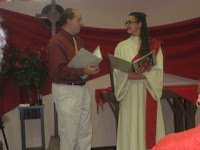 Dr. Jane Via and Associate Pastor Rev. Rod Stephens, the community strives to be an inclusive Catholic community whose mission is to: reach out to those who feel marginalized by the traditional Roman Catholic Church; live Gospel values, especially those of compassion, peace, and social justice, as taught and exemplified by Jesus the Christ; commit to the full equality of women and men in a transformed Roman Catholic Church and world; and create a new model of church community as a discipleship of equals through radical inclusivity in language, worship and ministry. Currently, the Vatican does not permit women to be priests or allow its local catholic communities to ordain priests (male or female). The Vatican has recently declared the ordination of women to be an offense in the same category as pedophilia. However, in the early Church, women served as priests and deacons and were selected from among their respective local church communities. Local communities were involved in the selection of their clergy at least until the 11th century and women were ordained as deacons until the 12th century. There has not been an ordination by a Roman Catholic community for at least a millennium. MMACC has not gone unnoticed by the Vatican. In its public statements on excommunication, the Vatican has implied excommunication of all members of MMACC and any Roman Catholics who assist in the ordination of women. A San Diego native, Nancy holds a Diploma in Theology from Oxford, and a Master of Divinity from San Francisco Theological Seminary in San Anselmo, California which is part of the Graduate Theological Union in Berkeley. She also completed post master’s studies in theology and Biblical languages in Switzerland. While raised primarily in the Presbyterian Church, Nancy had been drawn to many aspects of the Catholic tradition as a young adult. Ultimately, she decided against conversion to the Roman Catholic Church because of its hierarchy, patriarchy and refusal to ordain women. 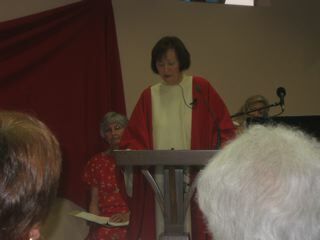 Searching for a more inclusive vision of church, Nancy joined the Mary Magdalene Apostle Catholic Community in 2005. Given her vast experience in spiritual, academic, and religious formation, Nancy was asked to serve as Pastoral Assistant. She was formally called to ordination by the community this year. Her current responsibilities there include adult education, serving as presider and homilist, religious education for the children, and many other tasks supportive of parish life. For more information about Mary Magdalene Apostle Catholic Community, please visit our website www.mmacc.org. "Rome has now connected the sexual abuse of minors and a ban on the ordination of women in one of its own documents. Perhaps those who crafted the document are on to something: The refusal to allow women into the inner sanctum of ecclesial power may well be related to clergy sexual abuse, and to the Vatican’s impotence in addressing this crime in a truly pastoral way. Is the attempted ordination of women a crime, or is the real crime the refusal to allow it?" Husband Russ witnesses to Nancy's being qualified to serve as priest. 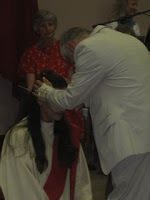 "Mary Magdalene Apostle Catholic Community ordained a female pastor Saturday, risking excommunication despite assertions that it represents the true roots of Roman Catholicism. 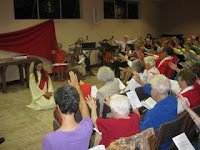 "Women's ordination is a crime worthy of excommunication because it defiles a sacrament. This is a new ruling. Pedophilia, which destroys the lives and souls of the victims, is a moral sin but it is not serious enough to warrant excommunication. But, women's ordination is not simple disobedience but is a sacrilege because the female body (being a second class creation) defiles the sacrament."